Rube Goldberg machines are designed to perform simple tasks in very complicated ways. 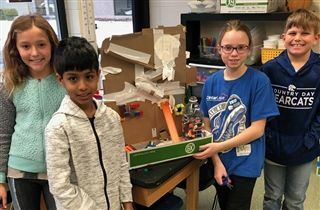 Fourth graders created their own Rube Goldberg machines during a recent interdisciplinary STEAM unit led by lower school teachers Terri Giesel, Rosanne Zabloudil, Jeannine Ary, and Becky Gallion. Each team of students was responsible for designing and constructing a machine that would make a marble go into a cup—in a very complicated way, of course! Students enjoyed this collaborative project combining science, art, music, and technology.